This is the mini network proxy application. It is a Windows tool that let's you share the internet connection of one computer to be also used by other machines in your local network. So you do not have to use Internet Connection Sharing when you have an address scheme that does not allow a machine to have an address scheme of 192.168.0.0 / 255.255.255.0 . There is a monitoring box that lets you see which URLs are accessed. The program is also creating log files for later analysis. A filter allows to control of accessible URLs. Unwanted content can be blocked to save bandwidth or you can just allow access to selected web sites only. A number of optional listening ports provides network flexibility. Create a text file named 'include.ini'. Enter filter strings on separate lines. Save the file in the application folder. Execute the ReDirProxy application. The strings from your filter file appear in the filter box. Select the option to filter out URLs containing the listed strings, or block all URLs that are not included. Ignore the list for no filtering. Define the port your local machine will listen for network requests. You have 3 options in case any port is already in use for other purposes. Decide to write log files or not. 'Short log' capture client's IP address and requested URL. 'Long log' writes time stamp and browser information for later analysis as well. The ReDirProxy waits for connections and displays the requests. If selected, log files are written after a certain amount of data is processed or when the program is closed. To change the settings for logs or listening port you have to STOP the program, change the options and RUN again. Changing the list of filter strings requires to EXIT the program, edit the include.ini and re-run the application. What to do with a client? A client is your standard web browser. Just set it up to use a proxy server. 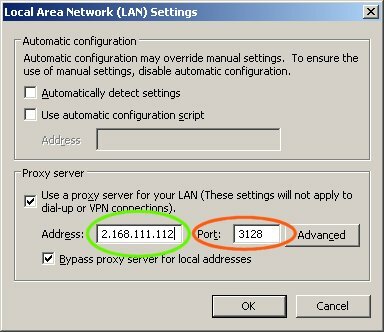 Make sure you supply the IP address or machine name of the computer running the ReDirProxy application. Enter the port which the application will use for listening on the network traffic. Surf to a web site and watch the traffic in the ReDirProxy window on the serving machine. The application allows PCs to get access to web sites without allowing them to have full internet access via other protocols. A dedicated server is not needed and the application needs no installation. Just create a folder, configure the include.ini and execute the program. The sometimes tricky configuration if Internet Connection Sharing (ICS) is not needed. Monitoring the web traffic gives an idea of what the web clients are doing. If you are familiar with setting up a port forwarding with your internet router it is possible to provide web services from your local network to the internet. Make sure to only allow needed URLs and addresses! You can also redirect traffic coming in from the internet to be sent back to the internet. So it is possible to use a web browser's proxy setting to connect to a machine located in a foreign country. This client can request web content which is normally not allowed in the clients local country. So the content is requested from the machine in the foreign country. The foreign machine running ReDirProxy is allowed to fetch the foreign content. It gets the data from the web and redirects it to the original local client. So you can extend your web access using ReDirProxy.